This article, specially written for the SLATE TRADE GAZETTE, will no doubt prove of the greatest interest to slate quarry proprietors. It is scarcely necessary to say that a personal inspection of the Park and Croesor Quarries would more clearly demonstrate the efficiency of electric power in its application to slate quarrying. Where a visit is not possible, the following description will serve to give our readers some idea of what has been accomplished in the early stages of a new era in roofing slate production. The properties of the Park and Croesor Slate Quarries Company, Limited, are upwards of 2,000 acres in extent, and have a length of 312 miles on the finest range of slate-bearing strata in the world. 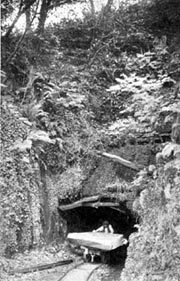 They lie in a direct line from the mouth of the London and North Western Railway Tunnel at Blaenau Festiniog to Portmadoc. The Company are in membership with the Festiniog District Slate Quarry Proprietors' Association, and its quarries form part of the Festiniog group. The Croesor Narrow Gauge Railway - 8 miles in length - was constructed, and still serves, to convey the produce of the Park and Croesor Quarries to the shipping wharves of Portmadoc, and to the junction with the Cambrian Railway at the Croesor siding, Portmadoc, where a large assortment of slates is always kept in stock ready for dispatch by rail or water. The Festiniog series of veins, comprising in ascending order The New " or "Deep Vein,"The Old Vein," "The Small Vein," "The Back Vein," and "The North Vein," and lying immediately on a thick stratum of felspathic porphyry, known locally as "The GlanypwIl Trap," traverses the properties for their entire length, and represents a slate reserve which, at a conservative computation, amounts to over two thousand millions of tons, of which over six hundred millions consist of the world-famous "Old Vein" slate. It is sad to reflect that the British building industry should use inferior slate from foreign and distant countries while a practically inexhaustible source of supply of the finest slate in the world is available in their own country, and at their very doors. The Moelwyn and Cynicht mountains, which are well-known landmarks in the country, and are veritably mountains of slate, are included in the properties. The Croesor Quarry was first opened about 55 years ago, and has since been worked on an extensive scale exclusively for " Old Vein " roofing slates. The Park Quarry was opened about 10 years later, and has been chiefly worked for slate for manufacturing purposes, such as slate ridging, slabs, etc., the perfect straightness of the cleavage which characterises the rock of this quarry rendering it specially suitable for this class of work. The two quarries are, in fact, the complement of one another, enabling the Company to supply its customers' needs in either roofing slates, slate ridging, slabs, or any other variety of article produced in slate. Both Quarries are worked entirely below ground, and are, therefore, more correctly describable as "mines" rather than by their usual designation of quarries. At the Croesor mine or quarry, the plan of development pursued has been that now recognised as standard in the underground quarries of the Festiniog neighbourhood, i.e., the alternation of chambers in which the slate is quarried, with walls of solid rock left to support the roof. The chambers and walls follow, approximately, the line of dip of the strata (averaging about 27°), with horizontal galleries, or floors, at convenient intervals, along which the traffic is conveyed to the haulage inclines, and thence elevated to the surface of the ground. The unusual thickness of the "Old Vein" in this Quarry - upwards Of 40yds. at right angles to the bedding, and over 110 yards on the horizontal - in conjunction with the fact that it has been frequently possible to work chambers up to 16 or 17 yards in width without endangering the roof, has resulted in openings of abnormal size being produced. To the layman, the existence of these enormous caverns in the very heart of a mountain is strange and startling, and few people, who have not personally visited the quarries, realise even to a faint degree the conditions under which slate is obtained. At the Park Quarry owing to a peculiarity in the dip of the pillaring or grain of the rock, it has been possible to reverse the ordinary order of underground quarrying, commencing at the bottom instead of the top; working the galleries in ascending order, and leaving the rubbish behind to support the roof and walls, instead of conveying it to the surface at great expense, there to become an unsightly blemish on the landscape. The various parts of the properties range froul 2560 feet in elevation to practically sea level, and, being situated near the Atlantic coast, have a heavy rainfall; this, with unique storing facilities, provides all the conditions for the production of hydraulic power to almost any required extent. One artificial reservoir, of about 12 acres in extent, has been constructed at an elevation of 1460 feet, and another, of about 5 acres, at an elevation of about 1650 feet, in addition to which there are natural lakes, of about 6 acres, which are likewise utilised, at an elevation of about 1750 feet. The waters from these (besides from various other sources) are applied to the driving Of 4 high pressure turbines (aggregating about 500 H.P.) to an 80 H.P. engine, and to the working of two Overshot Water Wheels (one Of 40 feet and the other of 20 feet in diameter) and these, in turn, are utilised for hauling, driving slate mills, pumping, and the production of electric power on the three-phase system. The electric power is applied to all the various requirements of slate quarrying and manufacturing where direct driving is not feasible. The electric plant comprises machines aggregating about 775 H.P. In addition to the use of electric current for power purposes, it is also utilised for lighting the quarries underground, and for lighting the mills; the latter being so efficient that it would be possible to carry on the manufacture of slate continuously throughout the 24 hours if so desired. (1) That the head of water utilised was the highest of any in the British Isles. (2) That the turbines were of a special, and exceedingly efficient type. (3) That it was the first application of the three-phase electric system to slate mining. (4) That it involved the use for the first time in Great Britain of an electric mining locomotive. (5) That it afforded the first example of the application of the multi-stage, electrically-driven, centrifugal pumps to slate-mine drainage. The Hydro-Electric system here installed was the subject of a paper read by Mr. M. Kellow (the General Manager and Engineer of the Company) before the Institution of Civil Engineers, and it will be within the recollection of our readers that extracts from this paper appeared some time ago in the SLATE TRADE GAZETTE. Compressed air has been in use for upwards of 30 years for the transmission of power, and, to a small extent, the working of rockdrills. For the transmission of power it has, however, been almost entirely placed, and for rockdrilling entirely so, by the very much more effective and convenient electric and hydraulic systems. The utilisation of compressed air as a means of transmitting power, though still in extensive use throughout the world, is exceedingly inefficient, the power obtained from the executive engines being rarely in excess of 10 per cent. of that applied to the driving of the compressor, no less than 90 per cent. being wasted in mechanical, compression, heat, and transmission losses, which are inherent in the system. When applied to rock-drilling, the result is even less satisfactory, being of the order of 1 per cent. of the input to the compressor. In comparison with these figures, it may be stated that, with electric transmission at this Company's quarries as much as 78 per cent. is being delivered by the motors of the HP. applied to driving the electric generators at the power station (one mile distant), and in the case of hydraulic transmission, approximately 50 per cent. of the power is usefully applied to rockdrilling and channelling, in comparison with about 1 per cent. in the pneumatic system. Until recently, and as a result of the inefficiency and many limitations of pneumatically-operated drills, the boring of rock for blasting purposes was done almost entirely by manual labour in slate quarries throughout the world; but Mr. M. Kellow, who has been associated with the slate industry all his lifetime, and who has made a deep study of the various mining and mechanical problems connected with it, has invented, and patented, a Rock Drill, which can be operated by hydraulic power, with a view to overcoming the objections and limitations in the pneumatic system. A limited company, viz., The Kellow Rock Drill Syndicate, Limited, has been formed to manufacture and exploit these drills, and already they have found their way into various important quarries of the locality. The Syndicate has the support and approval of many well-known and influential gentlemen connected with the slate industry. The drills have been in use for some time past throughout the Park and Croesor Quarries with very marked effects upon the output and in lowering the cost of production. To realise the tremendous advantage obtainable by mechanical drilling under this system it may be stated that holes which formerly took about 6 or 7 hours to bore by hand are now being bored from start to finish in about 1½ minutes, the average rate of penetration being about 5 feet per minute, which is a colitintinus rate, no stoppages for change of drill being necessary. One of the most unsatisfactory features in connection with the slate industry is the deplorable waste of valuable material which necessarily results from quarrying methods dependent principally upon the use of explosives for the removal of rock from its native bed, and it has been long recognised that if mechanical methods could be successfully applied to the extraction of the slate, that the present percentages of waste, which at present range from about go per cent. to as high as 97 per cent. even in well conducted quarries, might be very substantially reduced; but the great inefficiency both as regards power and speed of operation by any previously existing system rendered such processes commercially impossible, except in a few isolated cases were the exceptional purity of the rock justified extraordinary and expensive means for its removal. The extension of the Kellow rockdrilling system to channelling, has already given so much promise of success, that it may confidently be expected that in the near future a complete revolution in quarrying methods will result, the use of explosives being practically eliminated in favour of the cutting out of the slate in shapely blocks, with a minimum of waste. Needless to say, the use of hydraulically-operated machines which produce no dust, and the practical elimination of powder smoke from the workings will also enormously improve the hygienic conditions for the workmen. The attainment of maximum efficiency which is the principle that has governed the design of the power system in use at the quarries and in rock drilling machinery, extends also to the mills. Here are to be found machines capable of a larger output than are to be found elsewhere in the world. For example, blocks of 8 inch to 12 inch thick are being sawn at the rate of 3 feet and upwards per minute, without injuriously affecting the material by heat and detracting from its good splitting qualities. By means of an improved type of planing machine, a single operator can plane upwards of 10 tons per day of slabs from the rough, the speed of the table during the cutting stroke being from 40 feet to 70 feet per minute, and the speed of return from 200 feet to 350 feet per minute. Even at the high speeds of operation indicated, cuts 2 feet wide by ½ inch deep are being taken. This represents a rate of work from six to 2 ten times the normal. The principle which has governed the physical development and mechanical equipment of the quarries, has also been applied to the organisation of the methods of work. To those acquainted with slate quarrying methods, the difficulty of organising the work so as to keep both rockmen and slatemakers continuously employed is well known. This has arisen chiefly from the system usually in vogue whereby particular men in the manufacturing department derived their blocks exclusively from particular chambers, or bargains, in the quarry, with the result that the uniformity of supply could not be relied upon and time was wasted in consequence. At these quarries, however, the complete separation of the rockmen's contracts from those of the slatemakers was adopted upwards of 15 years ago, with the result that the entire output of the quarry in raw material is practically pooled for the purpose of manufacture, thereby securing a more uniform and continuous supply of blocks to the slate-makers and eliminating the losses prevalent under the alternative system. There is little doubt that if the slate industry of Wales is to hold its own against the competition of foreign slate, the softness of which, while being detrimental to its lasting qualities, has contributed to the cheapness of its production, and the fact that it has been made by workmen earning in some cases 50 per cent. less wages and working 30 per cent. longer hours than prevails in Welsh quarries, it must be by means of scientific methods, and the use of every appliance that will conduce to efficiency and economy of working. The foregoing description of the Park and Croesor Quarries is a proof that at least one Slate Quarry Company has not only realised the truth of this, but has followed it by definite action. Critics of our slate industry have reproached proprietors with lack of enterprise and a disposition to cling to antiquated methods of production. They have asserted that this spirit of conservatism has been largely responsible for the inroads made on our home markets by the foreigner inasmuch as it has retarded the rate of output. Though there may be a substratum of truth in this charge, generally speaking, this article proves that it cannot be universally applied. The Park and Croesor Quarries, to go no further, employ the most up-to-date methods and they do not stand alone in this respect. Foreign competition brings in in its train a great many evils but it has the advantage, at any rate, of acting as a spur on the home producer and forcing him to keep abreast of the times, if not a little ahead of them. Reprint from "The Slate Trade Gazette", February 1911.